Most employees who associate themselves with the company on their social media accounts ( such as listing their place of employment or posting photos of the company softball team) are doing so with a positive attitude. So you will find that there are employees who would love to be trained and asked to “share the company love”. Before you can reap the benefits of an extended social media footprint, you do need to set some clear boundaries for employees. The first step in setting the boundaries is creating employee social media policies. General Employees - If your business does not already have a social media policy in place for all employees, you should create one. The NLRB has laid out strict rules on what can and cannot be said in a social media policy, so reading through these before creating (or updating) a general employee social media policy is critical. Executives - While the PR or Marketing Department often handles social media for executives, it is important to have an executive social media program in place. This way executives understand how the PR department will be using their social accounts and won’t need to monitor every tweet that is sent out. If an executive wants to handle their own social media (which is preferable for an authentic voice), they should have basic training and guidelines from a corporate policy. Because they have higher influence and more notoriety, there should be a clear social media policy for company executives. Social Media Managers - Whether your social media managers are working on social media governance or social media marketing, there should be a separate policy for handling corporate accounts. 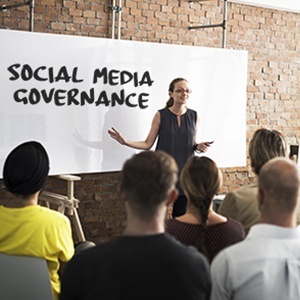 With strong governance training social media managers can better manage the brand standards, brand voice, and (most importantly) the risks associated with being a social business. This team also needs to be trained not only on policies, but governance procedures should a risk event occur. Social Media Employee Ambassadors - Though it may seem obvious, social media ambassadors need their own social media policy that is separate from the general employee policy. By creating a program that does include formal training and highlights monitoring procedures, employees can use their own social accounts and promote the company with accuracy and reduced risk. Social Customer Service and Sales - In order to help customers and leads, many corporate businesses create customer service and sales social media accounts to facilitate real-time interactions. Therefore your company should train customer service and sales representatives on how to use social media on these corporate-owned accounts, and actively practice challenging customer scenarios. If you are having your sales team use their personal social media accounts, there should be a separate policy that looks more like an Ambassador program, but focuses on sales activities and tracking conversions. Comprehensively document all employee training processes for consistency. Reference the location of all employee training materials in the social media governance plan (i.e. identify where workflows, protocols, procedures and other information tools are on the corporate network). Establish training goals and metrics to measure effectiveness (e.g. “certify 50% of employees as brand ambassadors”). Create a distinct training protocol for each social employee types (e.g. social governance team, social sales team, social customer service team, etc.). Identify the optimal training methods and tools to cover policies, compliance and procedures (e.g. webinars, on-site training, certification programs, etc.). Make necessary adjustments for different social employee types at various learning stages. Create training that includes brand standards, brand voice, content library access or ideas, risk scenarios with escalation process for help, and general governance items. Clearly inform employees if/how their personal accounts will be monitored as part of the social media governance plan. With strong policies and training, your Social Media Governance Plan will be a very effective guide to help build your brand and manage the risks to your corporation. Employee social media training is just one important part of a business’ social media governance plan. To learn more about the twelve steps it takes to create a solid governance plan for your company, download our eBook “The Social Media Governance Plan”. Through reading this eBook, you’ll learn about the audit process for corporate, employee and partner accounts while discovering which monitoring procedures you should implement to stay on top of your governance.